It also referenced a CAIR Islamophobia report that claimed over half of California's Muslim students had been bullied. This paper influenced the SDUSD's April 2017 decision to enter into a formal partnership with CAIR. Yet the SDUSD's internal statistics showed only two reported incidents of anti-Muslim bullying in 2015-16 among the entire 130,000 student school district. The OIC's interest is unsurprising. The 57-nation organization that touts itself as "the collective voice of the Muslim world" has urged Western educational curriculum be rewritten for the past decade. It also hoped to use "trade and cultural relations" between Muslim and Western countries to influence curriculum changes. CAIR entered into a formal partnership in 2010 with the OIC's Islamic Educational Scientific and Cultural Organization (ISESCO) to "redress the image of Islam and Muslims in textbooks." OIC officials regard Islamophobia as the "worst form of terrorism." Like CAIR, they consider terms like "Islamic extremists" and connections between Islam and terrorism to be bigoted. However, an OIC wing devoted to Islamic law ruled in 2003 that Palestinian suicide bombings against Israelis were not terrorism. OIC representatives decided in 2002 that Hamas and similar groups weren't terrorists. CAIR representatives attended ISESCO's 2015 conference and met with its director general, who briefed them on ISESCO's activities in the field of education, among other issues. ISESCO's General Conference called for partnering with civil-society organizations in 2015 to alter the portrayal of Islam and Muslims in Western curricula. CAIR provided the SDUSD board with training materials entitled Teaching against Islamophobia. Among other things, it taught that 9/11 reflected the "the rage toward the U.S. pulsing through the veins of many Muslims." The federal lawsuit filed by the Freedom of Conscience Defense Fund (FCDF) on behalf of local parents argued that, by creating a program specifically for Muslim students, the school district is discriminating against all other students. The school board formally withdrew three months later, after the lawsuit claimed that CAIR co-founder and Executive Director Nihad Awad acknowledged CAIR is a religious organization fulfilling a religious mission. That admission made formal partnership with CAIR a potential violation of the First Amendment's Establishment Clause dividing church and state. School district emails, however, show that work to implement a CAIR-sponsored anti-Islamophobia curriculum continued. An FCDF motion for an injunction blocking the school district from working with CAIR remains pending. CAIR's effort to influence public schools now extends beyond California. It also includes schools in Washington state, Minnesota, Pennsylvania and Illinois. In a July letter, FCDF warned Seattle schools that collaborating with CAIR to "address Islamophobia" could violate the Constitution. "After facing a huge setback for its pilot program in San Diego, CAIR is doubling down on its 'anti-Islamophobia' school agenda nationwide," FCDF Executive Director Dan Piedra said. "Any school district that opens its doors to CAIR is empowering a radical sectarian syndicate that seeks elevate Muslim students as a protected class." 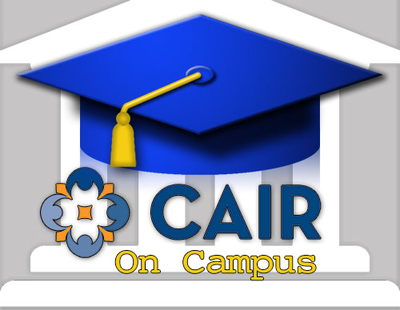 CAIR Washington representatives delivered a workshop at a Seattle high school in May, where they spoke about accommodating fasting Muslim students and their families during Ramadan and confronting bullying. Teachers in multiple Minneapolis-St. Paul area school districts participated in a CAIR seminar last month called "Positive Interactions Training for Teachers." One participant said that CAIR misidentified Christian Syrians living in Mankato, Minn. as Muslims. A separate PowerPoint used in a similar program last January included slides that called for making restrooms available for Muslims to do ritual washing before prayer; making potlucks halal by providing pork- and alcohol-free options for adult staff; and providing rooms within schools where Muslims can pray. Muslims can pack halal lunches and wait until afterschool to pray, Piedra said, adding that the courts have not established an absolute right to religious accommodation. Schools can deny religious accommodations if they decide they "materially disrupt normal operations." CAIR's Minnesota chapter also partnered last year with the Minneapolis Public Schools (MPS) to offer advice about "immigrant and refugee families." MPS also lists CAIR Minnesota on a separate page as a resource on immigrants. Minneapolis is home to a large Muslim Somali-American community. Minnesota's state Department of Education recommends CAIR under the category of "More Resources to Help Families and Others Address Bullying." Its website provides links to CAIR-written guides such as "An Educator's Guide to Understanding Islamic Religious Practices" and "Know Your Rights." "CAIR-MN's mission is to enhance the understanding of Islam, encourage dialogue, protect civil liberties, empower American Muslims, and build coalitions that promote justice and mutual understanding," the Minnesota Department of Education said. In Pennsylvania, CAIR performed sensitivity training in November 2016 in the School District of Philadelphia in the wake of President Trump's election. The Chicago Public Schools (CPS) recommends CAIR Chicago's Volunteer Activist (VA) Program and Internship & Externship Program for high school students. "Understanding that CPS requires service-learning to meet graduation standards, our office host opportunities available throughout the year for high school students to earn service-learning hours, or simply enrich their experience and insight to advocacy and civil rights efforts," the Chicago Public Schools wrote on a page on its website. Parents should be concerned about letting CAIR "dictate what should or shouldn't be taught about Islam," Piedra said. CAIR's cooperation with the OIC goes back decades. Awad spoke at a 1996 invitation-only OIC-sponsored conference in Toronto. He called on Muslims to engage in an all-out public relations campaign to educate the media, the Washington Report on Middle East Affairs reported. "CAIR and the OIC are already in lockstep on virtually all issues," IPT Executive Director Steven Emerson noted in 2007. A 2007 CAIR press release stated that Awad met with then OIC Secretary-General Ekmeleddin Ihsanoglu in Jeddah, Saudi Arabia to discuss "cooperation on future projects." "I'm pleased to meet with Ihsanoglu to discuss the situation of Muslims in the United States and to work on future projects," the press release said Awad told the Arab News. Awad attended OIC sponsored conferences in 2008 and 2009. He gave a presentation on Islamophobia in Western societies at a 2010 OIC conference in Sao Paulo, Brazil and represented CAIR at an OIC conference in 2013. "Education and engagement are key to challenging the growing phenomenon of Islamophobia," Awad said at the 2010 conference. He praised Ihsanoglu in 2013 when Ihsanoglu visited CAIR's Washington, D.C. headquarters. This was after Ihsanoglu led the unsuccessful charge to get the United Nations to criminalize blasphemy against Islam. "We appreciate Secretary General Ihsanoglu's vision, leadership and hard work to increase the effectiveness and profile of OIC's efforts internationally, and we appreciate his support of our work at CAIR," Awad said. CAIR serves as the "OIC's foot soldiers," said Zuhdi Jasser, founder and president of the American Islamic Forum for Democracy (AIFD). "There doesn't have to be any proven evidence of coordination between the two groups," Jasser said. "They are exactly on the same ideological page."